The Spanish Trail Cruisers was founded in the year 2000, by a group of 40 automobile enthusiasts from Crestview, Florida, and the surrounding areas. U. S. Highway 90, which is also known as the Old Spanish Trail, runs right through Crestview. 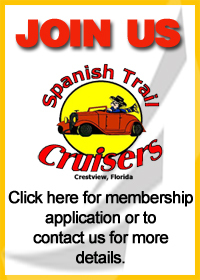 The Spanish Trail Cruisers was founded in the year 2000, by a group of 40 automobile enthusiasts from Crestview, Florida, and the surrounding areas. U. S. Highway 90, which is also known as the Old Spanish Trail, runs right through Crestview, hence, the name Spanish Trail Cruisers. We are a fun-loving, family oriented group, who enjoy cruising together on the weekends, attending and participating in area car shows and area "show 'n shines" and assisting others with their vehicle problems, challenges or projects. To learn more about us, cruise around our web site or you can learn more about the Old Spanish Trail at www.drivetheost.com. You might also like to visit our hometown's web site at www.cityofcrestview.org. Annual club dues are $50.00 per year. We hold our monthly meetings on the 1st Tuesday of every month at Hide-A-Way Pizza, on Main Street in Downtown Crestview. We arrive at 6:00 PM to eat and socialize, and at 7:00 PM the meeting is called to order by the club's president to address club business, discuss upcoming events, and more socialization. We close each meeting with a 50/50 drawing. To apply for membership, just click on the JOIN US link below, download the application form, print it, fill it out and bring it to our next monthly meeting or give it to a current member. Click " About Us " on the menu above to read our By Laws. On the 2nd Saturday at 5 PM of each month, the club has a “show ‘n shine” on the north end of Crestview in the Publix parking lot near Wendy's restaurant. Other events are announced during our monthly meetings and here on the event calendar. If you are interested in becoming a member, please complete our membership application. * Club Members, if you have any ideas, wishes or desires for things that you'd like to be published to our website, please click on "About Us" on the menu and email John Colby.